The Veil Nebula is part of the Cygnus Loop which comprises several NGC objects. Shown here is NGC 6992 in the Eastern Veil. 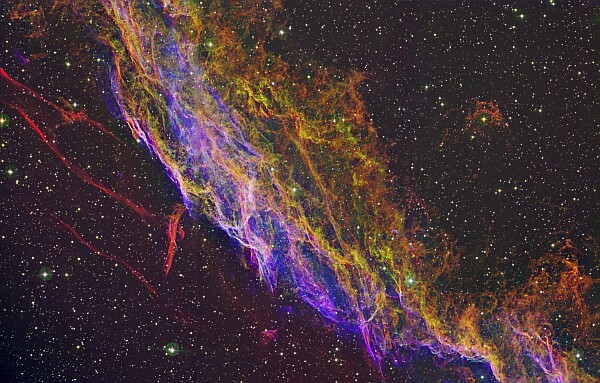 The Veil Nebula is a faint supernova remnant that exploded some 5000 years ago, and since then it has been expanding on the sky to cover some 3 degrees. Its fine and intrincated filaments are attributed to a thin shock wave propagating into space and seen edge-on.